To get to Peru from Arica, I walked to the Terminal International and got in line with the other potentiale emigrants that were already there. It is a bus terminal, but for international traffic they don't use buses, instead they use large, old American private cars with lots of dents on them and scary drivers in them. These drivers walk along the line and carefully pick their passengers in a way that maximises the number of people they can cram into each car. After 30 minutes I got lucky and was offered to hand over 2,000 pesos in return for the promise of a seat in a car. Soon after the car appeared, and I even got a front seat, which was luxury compared to the 5 swelling women that had to share the back seat. They were smiling, though, knowing that if we were to crash, I'd die first. The driver got in and did something that freaked me out; For the first time since I arrived in South America someone actually used the safety belt! I hastily tried to put on mine, but that just resulted in a waving finger and a "No funcionada" from the driver. So I braced myself, and off we went. Hello, Third World! We left the city of Arica and entered an empty desert. The Chilean border check was quick and efficient. The Peruvian was, well, they did not really check my luggage, so I see why this is considered one of the major routes for getting drugs out of Peru, but they DID dig out an old typewriter to write some kind of report on me. Or maybe they were just showing off their equipment. I was allowed into the country, though. Soon thereafter I was dropped off outside the Terminal Terrestre, the main bus terminal in Tacna, Peru, where everything can be fixed, especially people you don't like. I got 280 nuevo soles for 80 US dollars from an old women that I figured I would be able to track down and haunt, should I discover she had somehow tricked me. I bought some breakfast and the local paper, both of which told me I was in a different place now. The breakfast contained nutritional additives, or bugs, if you like, and the newspaper's main story was that so far this week this 100,000 people city had had 11 murders, and the weekend was yet to come. Encouraged by this I immediately booked myself onto the first bus out of there, a 7 hour ride to Arequipa. Just in case I would be killed on the way, I hurried and bought a bottle of Inca Cola, so that I could at least say I'd had a taste of Peru before I perished. Inca Cola is a funny drink. It has of course nothing to do with incas, but it's piss-coloured, tastes like Hubba Bubba, the cheery bubblegum that doesn't stick to your face but makes great bubbles, and it's the number one soft drink in Peru. I felt alive, for the moment. They actually had a working video player onboard the bus, and they did of course show "Lethal Weapon 4", which appeared to amuse all the passengers tremendously, especially when there was shooting. I imagined that the reason they were all laughing was that they were thinking "Ha-ha, that man just fired 10 shots out of a Luger-44, everybody knows a Luger-44 has only 8 bullets in it", and things like that. I just concentrated on keeping the hands of the old witch next to me out of my pockets, where she must have thought I kept my money. I gave her the rest of my nutritional breakfast sandwich and bought myself some goodwill that way. Outside the bus windows, which I could only look out of for a few seconds now and then before people who got annoyed by the resulting glare in the TV screen started hitting me, a mountainous desert rolled by. After 3 hours we rolled into Moquegua. At first sight it seems like a nice place. There's a man employed to chase the pigeons away from the city square, so that they won't soil the statues and nice brickwork there. There's also a number of indians with funny hats sitting around the same city square, selling maize that children can feed the pigeons with. Now, THERE's a conflict of interests! I reckon it won't be long before the local paper here also starts writing about murders. Hence my first real stop in Peru was Arequipa. It has about a million inhabitants and is maybe the second largest city in Peru. At least, that was the situation back then, but a few months later there was a big earthquake here, ruining a lot of houses and leaving many victims dead. Even though it's a big city, it is also a very green city. Unfortunately that is not due to its many parks, but because of all the policemen wearing green uniforms and bulletproof vests that are standing on each and every corner of large parts of the city. They didn't smile very much, so I think they're actually there for a reason. If there's one thing that makes me feel very unsafe, it's a policeman on every corner, but they probably meant well. In my nervousity, I got in a cab that took me to Hostal Latino, which according to my travel bible should cost about US$17 per night, which is expensive, but at least is in a relatively safe part of Arequipa. That was indeed the going rate, well done to Lonely Planet, but as soon as I showed signs of wanting to check out the rate at the neighbouring hotel, they told me I could decide the price for myself. So I had a look at the room and said I believed US$10 for that room would be a fair price, and so it was. I got a big, nice and clean room with a hot water shower, thick blankets and a TV. The clerks were really nice people, who even took the trouble to find and wipe the dust off of an old book some visitor had left there a long time ago, when I asked whether there might be a chance there was any literature in English lying around. I'm glad they found one, because I feel sure they would have written one themselves if not, and they did not really know much English. They also gave me a city map and drew a circle around the area they would let me walk around in on my own, if I promised to be careful. It was a very small circle, basically containing the hotel and a restaurant run by the nephew of the hotel owner. Arequipa offers a lot of sights, all of which are churches and monasteries. The city was refounded by the Spanish in 1540, making it one of the oldest "European" city in America you can visit, but thanks to a great number of earthquakes hitting the city throughout the centuries, most of the old stuff is all gone. I learned this when I went to the tourist information, which turned out to be the tourist police station, all the people working there were police officers. They also told me I should never carry my passport, money or credit card with me when I walk around, on second thought, I should not walk around, but travel by cab, oh, and don't go with any tag, just the licensed ones, as the unlicensed ones usually were robbers. And never should I just put my backpack on the floor when sitting down, but always keep it tightly squeezed between my legs, unless I'm wearing it, of course. But the mountains outside the city were nice, they said. I decided maybe I should head for the mountains, real soon. Despite my recently acquired low expectations, I did have a nice and lazy day in Arequipa. Getting up with the sun, I walked around in the Sunday morning silenced streets in the area designated safe by my friends at the hotel, and suddenly I found that the beautiful, imposing mountains and volcanos around the city were now actually more visible to me than the police with their full body armour and the suspicious-looking locals. I walked past the Santa Catalina monastery just as they were opening their doors for visitors, and I got the place for myself for a couple of hours. It's a big place, 20.000 square meteres, and it's an interesting place. It started out in the 1500's as a monastery, or rather, a convent, for the daughters from very rich families back in Spain. The custom then was that the second oldest daughter in the family was to be sent to a convent to suffer on behalf of the family, who were then free to gorge themselves with all fruits of Life. Since the nuns often weren't really motivated for the kind of life you lead in a convent, this turned into quite a different convent, since the nuns brought with them slaves to do the chores and musicians, in case they got bored by all the praying and stuff, and they ended up with spending most of the time in the convent partying. And so they partied for the good part of 300 years, before the Pope decided they had had enough fun now, and sent over one of the strictest women in history over to have some changes made. Judging from the silence here now, she succeeded pretty well, and it is an excellent place to walk around alone in on a Sunday morning. There are hundreds of small and big rooms, there are great paintings from thegoodolddays, and incredibly beautiful contrasts between the thick, red walls and the clear, blue skies, with lots of greenery in between. It is well worth the 15 soles entrance fee. If enough people go there and pay, maybe someday the nuns will be able to afford to party again. Those of you who have followed my travels for a while may recall that my record in intimacy with rodents was when I woke up sharing my sleeping bag with two rats, somewhere in South-East Asia. That record was eternally and thoroughly broken when I now had a guinea pig for lunch. With fries. 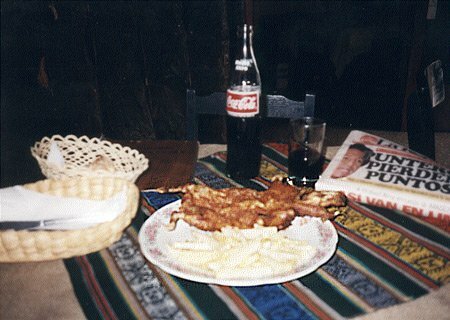 To those of you who are about to leave for Peru: Guinea pig, or cuy, is NOT pork meat from Guinea, instead it is a very recently butchered, skinned and deep-fried or roasted rodent, not looking very edible, positioned spread-eagled on your plate with head, teeth and claws intact. Without the fur they look fairly rattish, actually. The taste is a bit uhm... special, but there's very little fat and I think most people will be able to down one, especially if you don't look too closely at it while you eat. To me it was probably a once-in-a-lifetime lunch. Been there, done that. I got a big applause from the diners at the next table when I finished. It turned out that eating guinea pigs is a very old Inca custom. The old Incas discovered that the guinea pigs were easy to domesticate, and did not require much feeding or caretaking, and the children loved to play with them. So they always kept a herd of these animals running around inside and outside their houses, and when there were visitors or a special occasion rised, fresh meat was very readily available. Makes sense. Except maybe when the children started to cry. I once again checked in with the tourist police station to find out what my chances of getting up on the nearby Chachani, to finally get over the the 6000meter line on this planet. Chachani supposedly is one of the easiest 6000m+ peaks in the world, so I was quite eager to give it a try. The tourist policeman said that it wasn't exactly illegal to go up there this time of the year, but that it should be, due to dangers caused by avalanches, mudslides and sudden storms that may arise. I checked about ten trekking agencies, and they were all willing to go, as long as I paid well the conditions would be just perfect, they said. I put two and two together, and decided on a two day trip to the Colca valley instead, where the second deepest canyon in the world can be found, only slightly beaten by the nearby Cotahuasi Canyon. The agreement was that I would be picked up at 8 in the morning from outside the hotel, so at 9:15 I got on the bus as the last passenger, and we drove straight out of the city through an incredible number of alleys and one-way streets. When we reached the outskirts of Arequipa we stopped to buy coca leaves. A sol and a half was the price for a tiny bag of this green medicine of nature, promising to protect us from phenomena such as altitude sickness, sanity and white teeth. I bought two bags, just in case one wasn't enough to achieve all this, and started chewing it at once. We headed straight for a 5000 meter pass to get to the Colca, and as we stopped at the top I went for a run, my t-shirt now covered with green grass stains, and I actually felt much better now than I did at similar altitudes in Nepal before. Therefore we can conclude that coca leaves are nice to have up there. 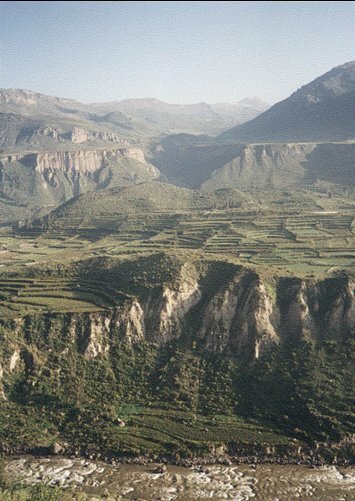 The Colca valley used to be the granary of the Inca state. Here there are vast amounts of cultivated fields, but infinitely nicer to look at than for example the corn fields in the US Midwest, since here the fields are not really fields, but just lots and lots of terraced farmland. A few hundred years ago every inch of arable land was exploited, but now much of it has fallen into disuse, presumably because people are too busy chewing coca leaves, or maybe they have discovered it is much easier to get their vegetables from the grocery store than from the fields. In use or disuse, it is an amazing sight to watch these some places hundreds of terraces on top of each other, built with great care by the indians a long time ago. The indians, by the way, don't consider themselves indians. Instead they insist on being called campesinos, as in peasants. No wonder, when you look at what they must have been working on here for centuries. At a pinch, they'll accept "indigenas", meaning natives. We arrived at our base for the night in the afternoon, and it was a campesino village at about 3700 meters. I checked in at Hostal Posada del Inca, claiming to be a two star hotel, but I think that in that case I must have been one of those two. I felt very much at home there with the friendly staff, who laughed every time they saw me. It was a clean place, but the shower's two taps only gave water at icicle and runny icicle temperatures. There were 40 rooms, so it's quite a decent-sized hotel, and since we were only 9 staying guests, it was pretty quiet. Except in the neighbouring room, of course, where someone was very much into Culture Club and general techno music. After this day in the Peruvian highlands, I had now seen all the four cameloids of South America in the wild. Let me give you the short briefing, all you need to know to tell them apart; On the top of the ranking are the vikuñas, who yield the highest quality wool, then there are the llamas, who do not have any fur on their heads or hind legs, as opposed to the alpacas who do grow fur their but on the other hand do not grow taller than a meter or so, and last there are the guanacos, who are something on their own. All in all I laughed at quite a few stupid-looking cameloid faces of the various kinds throughout my two days in the Colca canyon, they are almost up there with the penguins. On this momentous day I even had an alpaca steak for dinner, hoping the meat was good so that the last laugh would not be on me anyway. That's a new entry on my list of animals I have eaten, by the way. For sunset we went to some thermal hot springs, which were pretty luxurious by third world standards, but very nice by any standards as well. The water stayed at 35-40 degrees Celsius, and the pool was clean enough that it was possible to enjoy it without worrying about what kind of bacteria might lurk in the water. I also went for a walk near the hotel and got a taste of what I had in front of me the next couple of weeks, when I discovered an Inca bridge leading over the river to an Inca stairway that took me up to an Inca tower. I suspect they all may have been discovered before, being only 100 meters away from the village center and everything, but it was still a nice and fairly exciting discovery to me. After dinner in the evening I was tortured. For three hours I sat in a restaurant, and was exposed to countless pieces of Andean culture and historical music; it will be years, if not decades, before I once again can stop in the streets and enjoy the South American pan flute street musicians that strangely never fails to appear in the middle of the main pedestrian street of any given European city. I had nightmares for days after this experience, I completely overdosed on something I previously thought of as a nice thing, I pray this never happens to me and chocolate! Not only did we get to hear the music, we also got to witness the local dance culture of the area. Lots of it. Let me say that this was not very much like the kind of dance you can see when you witness the flamenco, the merengue, the salsa, the samba, the sardana, the tango. No, this was quite the opposite. No in-your-face sensuality, just a rhytm that somehow was there, it just wasn't visible. "The Love Dance" was a lot of jumping up and down with good distance between the partners, with the occasional kiss blown across the room. There was also a weird backward version of the polonaise, and of course the seedcorn dance, which basically was miming a farmer's life. None of those can explain any increase in population, I tell you that. But in smaller doses than three hours, it just might be enjoyable. For all I know. There was of course a condor dance as well, with the dancers flapping their wings to the tune of El Condor Paso, a melody anyone visiting Peru will hear a thousand times, unless they are deaf. I have to say that seeing condors live beats the dance. The main goal of our excursion was to go to Mirador Cruz del Condor, one of the few places in the world where you can go and be pretty sure you'll be seeing, from ABOVE, condors floating in circles over a deep, deep canyon. The spot is pretty unique in other ways as well, with a view towards the river at bottom of the canyon, 2000 meters below, and with the peaks on the other side of the narrow canyon climbing another 1800 meters up above you. If you're lucky enough, though, the condors will play the leading role, with a wingspan of 3 meters, a length of 1 meter and 25 kilos of weight, making them the largest airborne birds in existence today. Seeing them glide in and out of the fog that drifted through the valley was enough to make me smile for the rest of the day, even when I encountered the giant cacti that grow here, reminding me of my misfortunes in El Calafate a couple of months back. On our way over the pass going back to Arequipa, quite a lot of snow had fallen all the way down to 4,200 meters, so I made a final decision I would not try for the 6,000 meter peak now. Too bad, I don't think I'll be so close to that altitude again in quite a while. Amazing fact: Here, at the volcano Mismi, some 150 kilometres away from the Pacific Ocean, snow is melting at 5,000 meters, creating small rivers that flows eastward to become the mighty Amazonas that thunders into the Atlantic Ocean somewhere near Africa. You can go wow now. I gave myself another day in Arequipa, feeling more in control of things since it was now, afterall, my second visit to the city. There I discovered a tiny museum, Museo Santuarios Andinos, where I was the only visitor. So they ran a movie theatre showing of a National Geographic video showing me what I was about to see (don't ask me why), then I got a guided tour through the items I had just seen on film, and then the guide got a dollar from the one visitor, me. 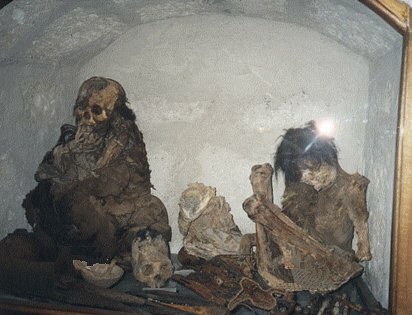 While other museums run a pretty much try-to-figure-out-what-you're-seeing-for-yourself thing, this museum shows Inca mummies that has fallen out of nearby volcanos, and they have decided to do it with as much respect for the dead as is possible. It was fairly interesting. It turns out that the Incas figured that burying people on top of mountains was the right thing to do, so now when there's an earthquake, they have to run up in the mountains and see if any bodies have fallen out of their hidingplaces, and quite often they have. The jewel in the collection here is Juanita, a female that slid 160 meters down from a moutaintop and was protected from the snow by ashes from a nearby volcano, so that when she was foundby climbers, she was in an exceptional condition. Because these mummies were buried with lots of metal items in the graves, many of them have been heavily mutilated by lightning, but Juanita is quite the looker. She probably walked up the mountain with a gang of high priests, was stoned on coca leafs and more, was hit in the head with something heavy and buried in a crouching position, fetal-like, so that she would be easily reborn. One day, maybe, Steven Spielberg will come here and find all this fresh Inca DNA everywhere, and soon thereafter we shall have "Inca Park - The Lost Kingdom" in theatres everywhere. I think it's going to be pretty neat. The neatest experience of this day, however, was the Recoleta franciscan monastery, no doubt. It is amazing what you can find in a 500 year old cloister that has been spared from fires and earthquakes. Squeezed in between their holy relics and pre-Columbian artifacts there was an animal section, with 8-9 meters long anaconda skins on the walls, stuffed giant fish from the Amazonas, large numbers of beatles on pins and various other animals without names. There was also a collection of 17th century calculators, but I'm not sure whether they worked or not. I was the only visitor at this museum as well, so I had to turn on the lights in each room as I entered, and turn it off again when leaving. I never did that in a museum before, but it added to the atmosphere. In some of the rooms I left the lights off, and instead walked around in the dark cloister halls with my flashlight on, and the exhibits became much more exciting, while at the same time I became much more Indiana Jones. The very, very, very most unbelievable part of the collections was, by far, the library. They have some 20,000 volumes here, of which 4 are from the 13th century (I'd never seen that old books before), hundreds of books are from the 1500's and a large part of the rest are from the 1600's. They even had the complete 120 volume French revolution encyclopedia occupying one long shelf. There was also a large selection of detailed maps, covering most of the known world in the Middle Ages. I found it a bit weird that the munks in this far-away monastery should have better maps of Norway than most Norwegians back then probably had. And so it happened that I had my biggest bibliophile experience ever, at a most unexpected location. Still high on my encounter with priceless treasures with covers, I went to the bus station, where I wanted to find a way to get to Puno, the largest city at Lake Titicaca. I have never had anyone recommend me to take the nightbus there, and I was soon to find out why. Come to think of it, I have had many recommend me NOT to take the bus, but I must have temporarily forgotten about it right then, because here I was, getting on. The ride is a 13 hour one (US$10), so it is kind of hard NOT to take the nightbus somehow, but in hindsight, I think I would be happier on an all day bus, or breaking it into two half day rides. The number one rule to follow on the bus would be not to eat anything that was offered me, according to the anxious hotel personnel who saw me off thoroughly, since there were noone else at the hotel to look after. Also I should not sit by the aisle, because that would make it easy for someone to steal my things when they walked past. And I should not sit by the window, because the windows can be opened from the outside, and then someone could steal my things and run away quickly. And I should not leave anything unattended, as it then would disappear magically in an instant. I just put everything I really needed into my small daypack and held onto it, politely declining everything the campesinos offered to sell me, ranging from chicken sandwiches to chickens and funny hats. At least they kept me awake, so nothing was stolen from me. During the evening we also saw "Freedom Fighter" with Peter Fonda, and "The Iron Triangle" with Beau Bridges. I wonder how much those actors would pay to have all copies of those two movies destroyed. They were lousy works of "art", and there was shooting all the way through them, which didn't sound too good on the dysfunctional loudspeakers. At least it kept me awake when the campecinos stopped trying to sell me their stuff. By midnight everybody else were sleeping, so I thought maybe it was safe enough for me to do the same, but by now the temperature had sunk to somewhere around freezing. The only way I could sleep now would imply that I would never wake up again. The Andes above 4,000 meters at night is a cold place to be in a bus with lots of holes in the walls. The shivering cold night came to an end with a spectacular sunrise over Lake Titicaca, and I was tired but happy. I haggled a good room in Puno down from US$20 to US$10 and slept for a few hours. Then I had a hot shower that wasn't working (probably because of my haggling skills), and went outside. The streets of Puno is all chaos. The sidewalks are half a meter wide and the streets about four meters wide. Within this space there shall be room for pedestrians and traffic in both directions, with drivers who are not exactly tamed yet. It's very, very dangerous to be a part of, and I couldn't help comparing it in my mind to Kathmandu, with all its restaurants, handicrafts and potatoes on sale, exchange offices and travel agencies. In the morning it was literally freezing, but around lunchtime it's summer again, and if one can find a park with a bench to sit on, Puno is a place one can be happy in for a while. Having seen the sights of this falling down city, I did not hesitate in leaving it for an early evening excursion. I was packed into a bus that took a group of tourists out to Colla-land, Sillustani. The main attraction here are the funerary towers, called cullpas, that are still standing, four hundred years after the collas left in their spaceships to nobody knows where. The collas was one of the tribes that were among the "main tribes" in the big Inca family, but they came here and settled long before the Incas came along. Life along the banks of Lake Titicaca must have been good, it is fertile land and a good supply of water coming down from the mountains. So the collas became numerous, at least a hundred thousand of them, and when one of them died, they buried them in style, with big gravemounds. Then the Incas came and incorporated the tribe in the Inca empire, and it has to be said that the graves became substantially more impressive after the collas had been to the Inca Stonebuilding Academy. The tallest ones still standing are 12 meters high, and when they fall down it is not due to bad engineering, but because all the gold, silver and copper inside the graves attracts powerful lightning bolts, that tend to bring damage to the graves. They've put up lightning rods now, so there's a good chance the graves that still are standing will remain so for quite a while longer. The main attraction in Puno of course is to sail out to the floating islands, Islas Flotantes. 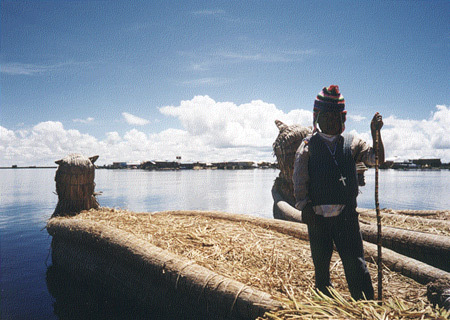 The closest ones to Puno are the ones forming the "village" Uros, and that's where I went. In a small boat we were taken out to one of the islands, passing a group of swimming pigs from a floating farm, on our way. Slightly surreal. But then we came to the first island, and it certainly was just like a normal village, except the ground kept moving everywhere. Very picturesque, very fascinating, but also very demanding on the inhabitants, who must genetically be immune to motion sickness. The reason these people moved out here was that they prefered to be on their own, safe from the Incas and other warlike tribes on the mainland. By now, though, the people ashore is the least of their worries, instead they all die at a fairly young age (40-50 years old) from bronchitis and rheumatism, due to what one might call dampness in the basements. Still, since they can make a good living off tourists and because they have discovered a fish that they can eat in order to prevent hangovers, they figure they might as well stay out there for a while longer. It's hard work, though, they have to continuously refill their streets and houses with fresh reeds, as they rot from below. They have everything they need out there, apart from satisfactory living conditions that is, and one of those things is "escuola flotante", "The Floating School". It must be cool to be so lucky to attend that school, considering the alternative, the sunken school. I donated large amounts of pens and balloons to a teacher at the school, and went back to Puno. And in Puno I got tickets for the next morning's train to Cuzco.